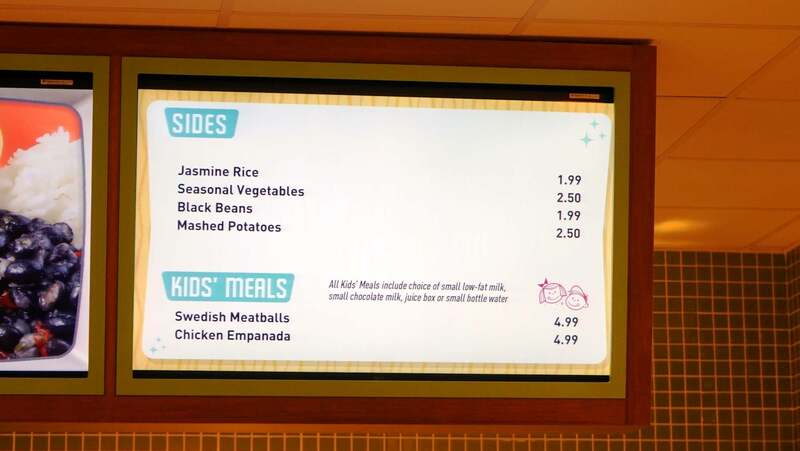 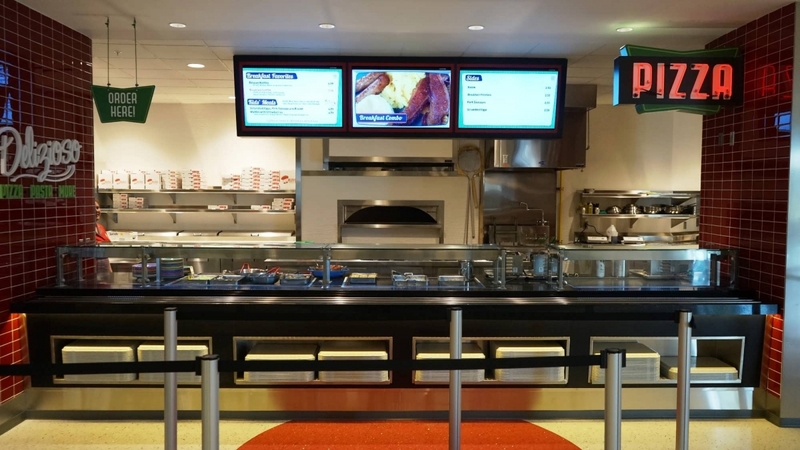 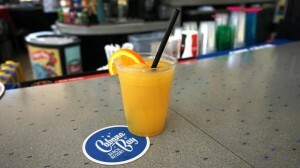 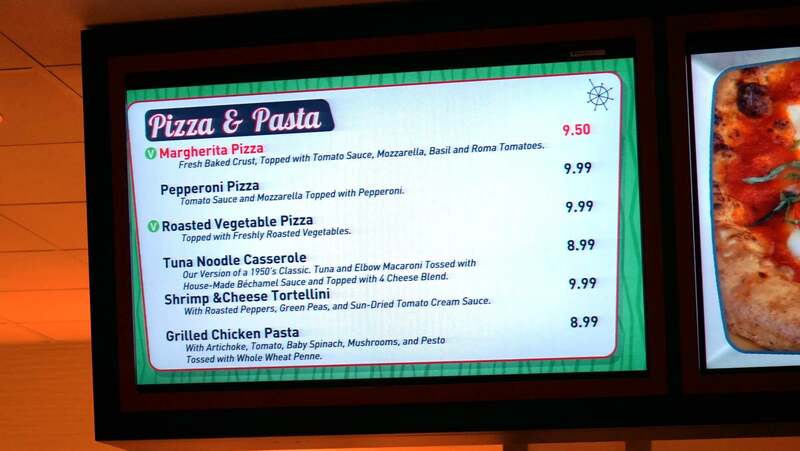 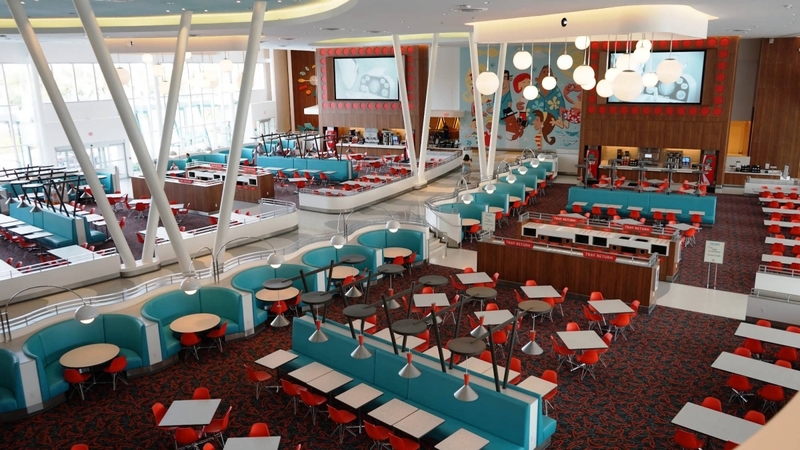 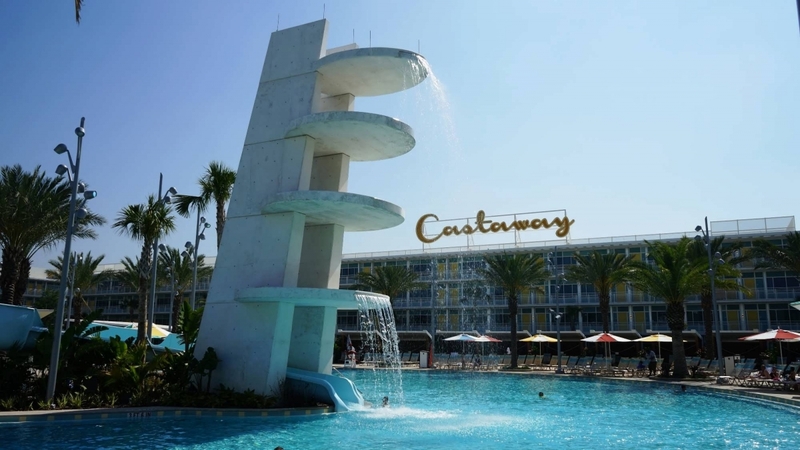 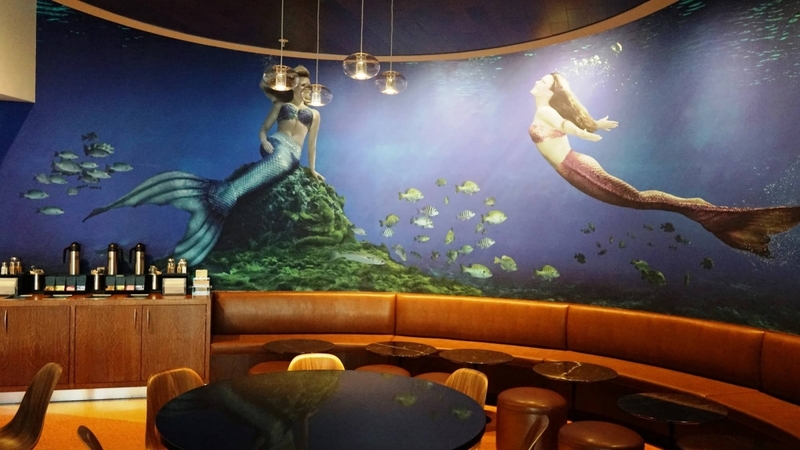 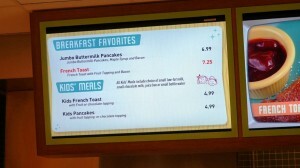 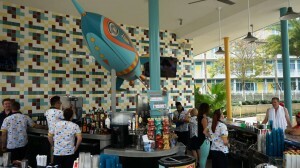 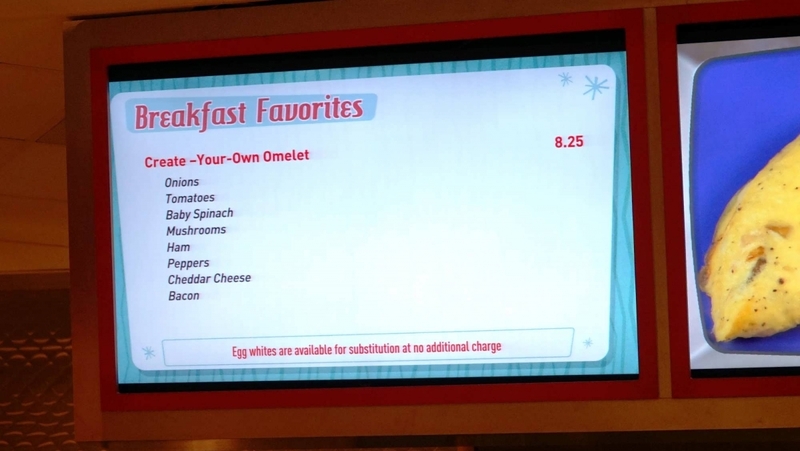 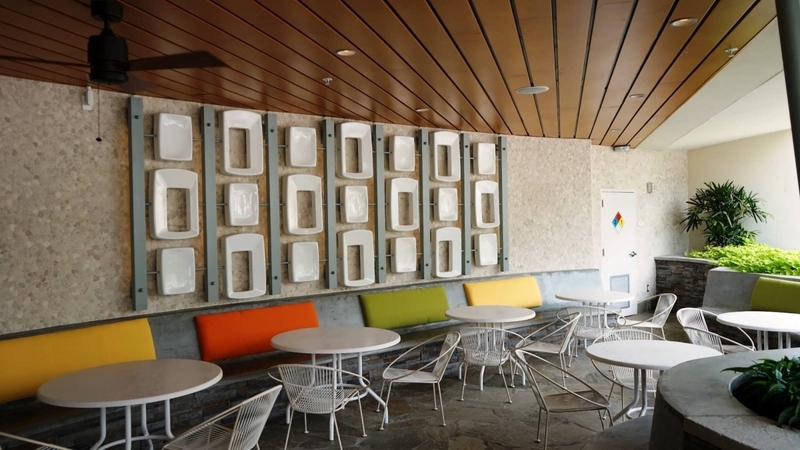 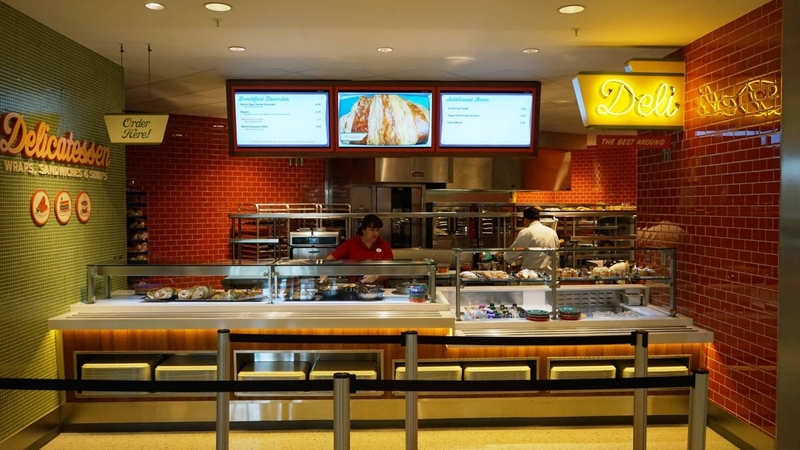 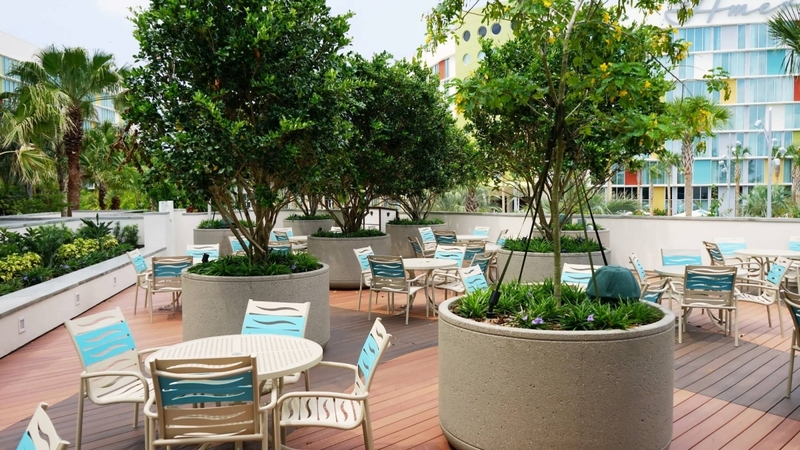 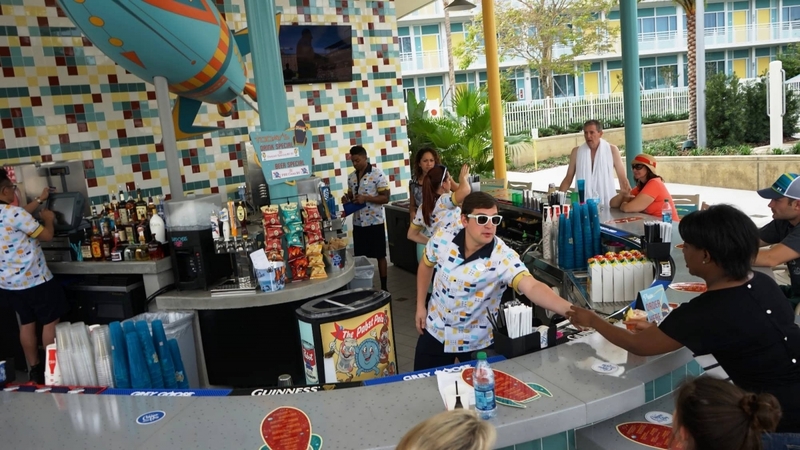 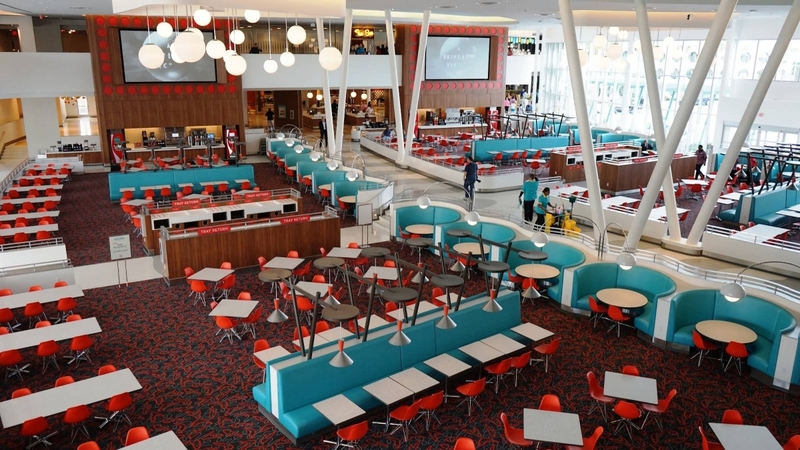 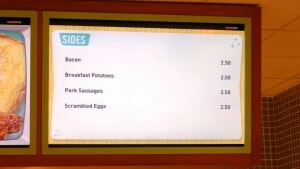 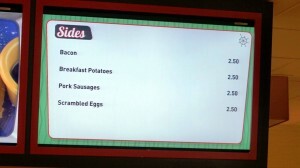 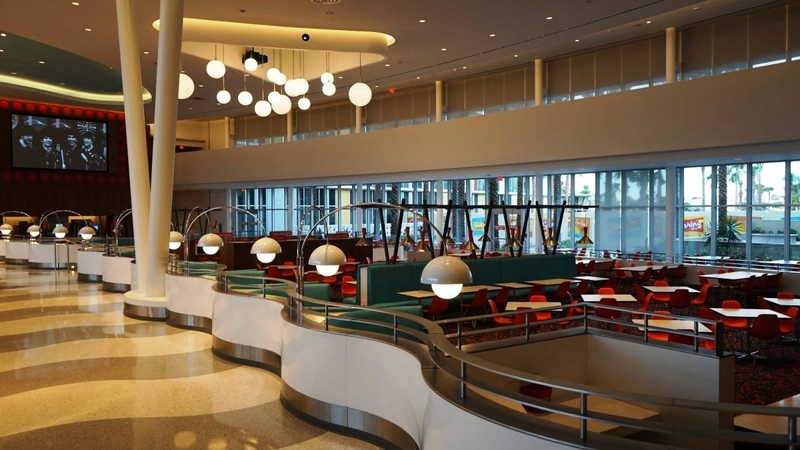 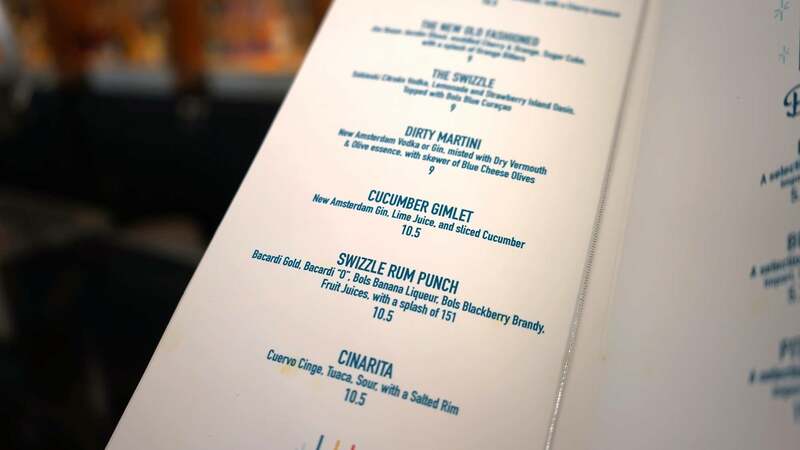 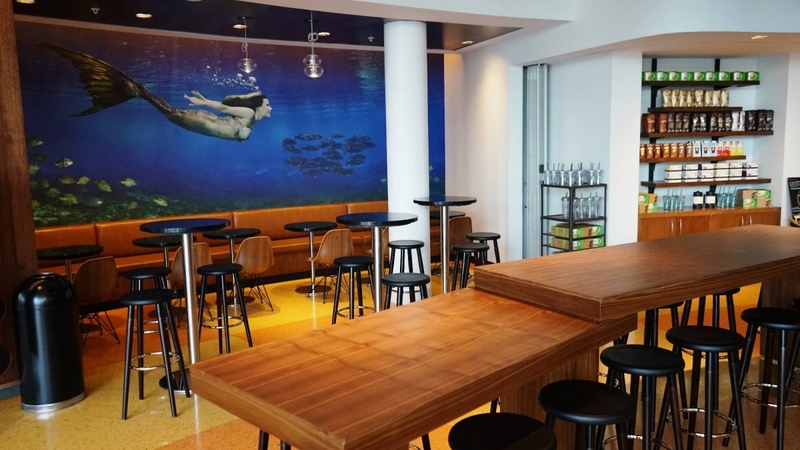 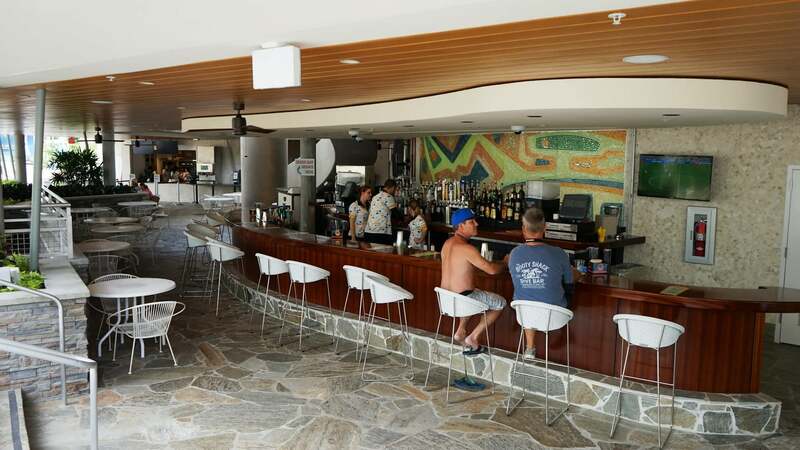 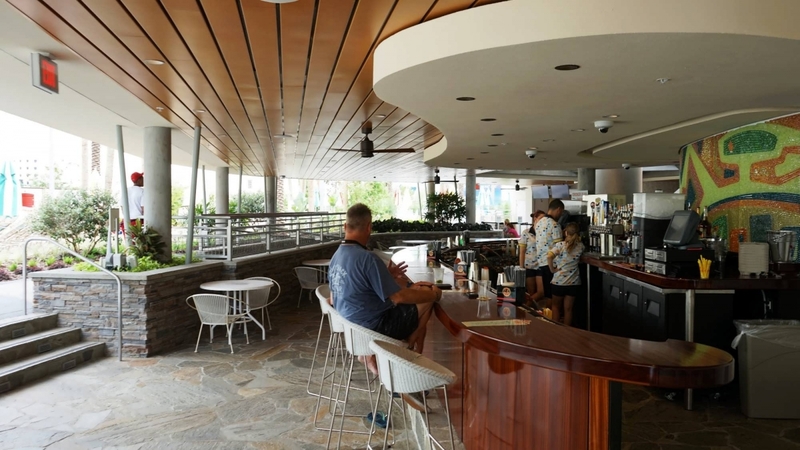 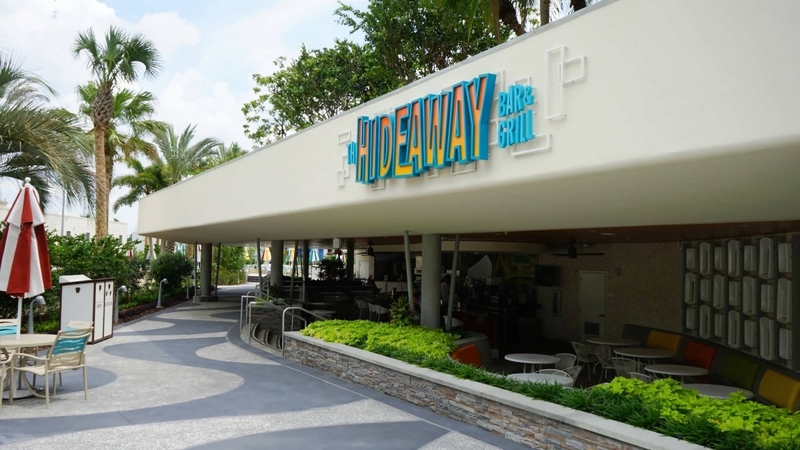 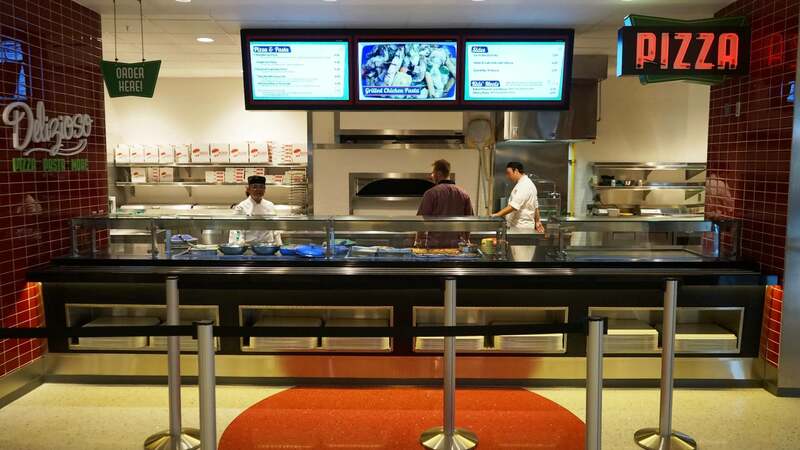 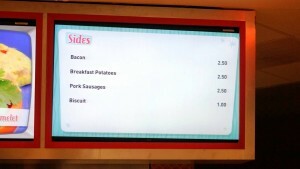 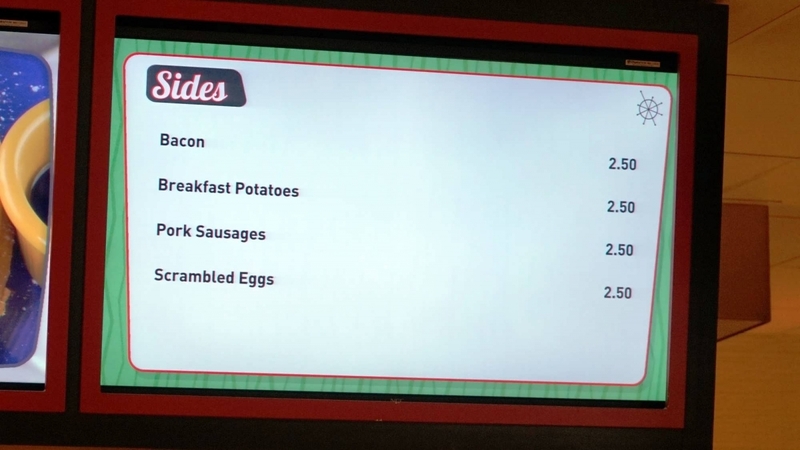 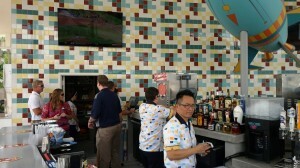 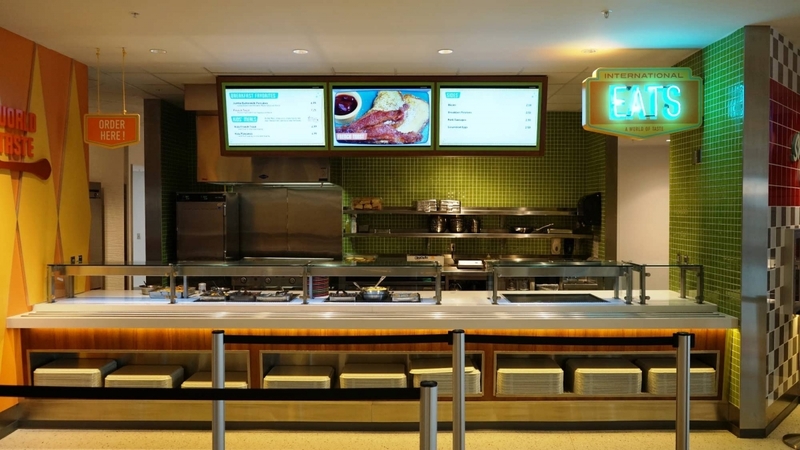 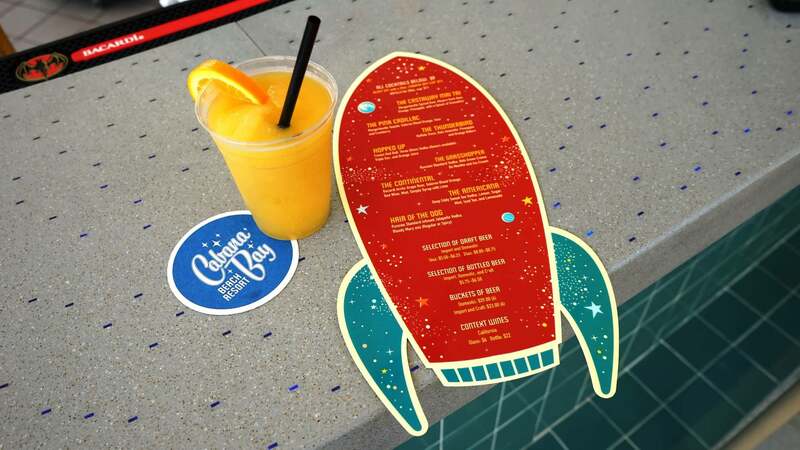 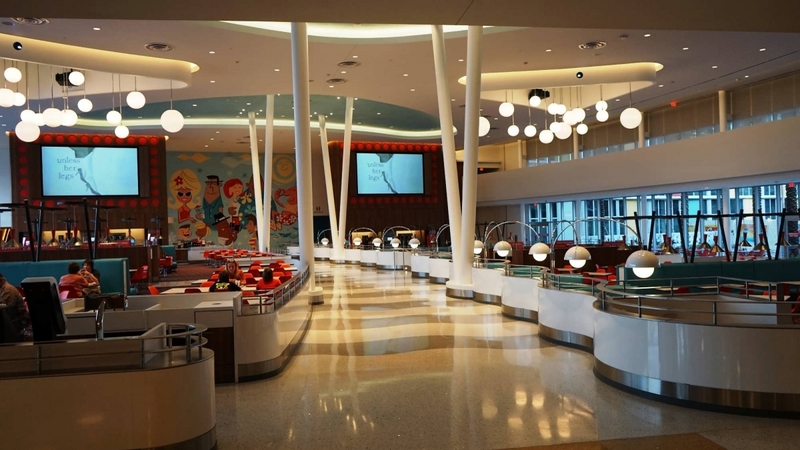 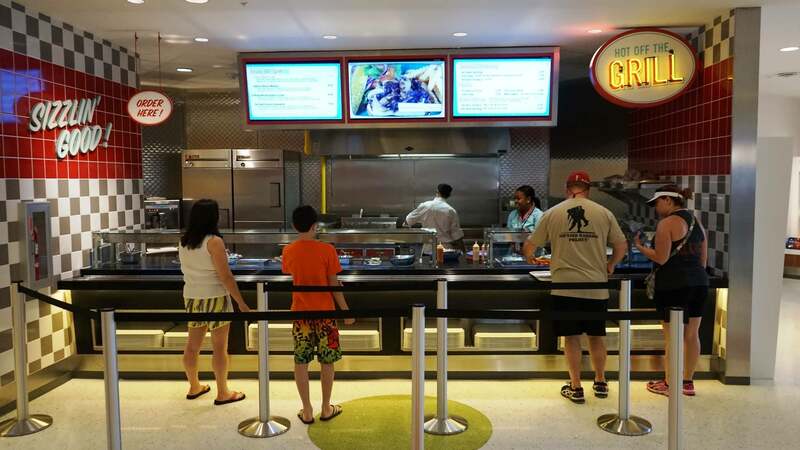 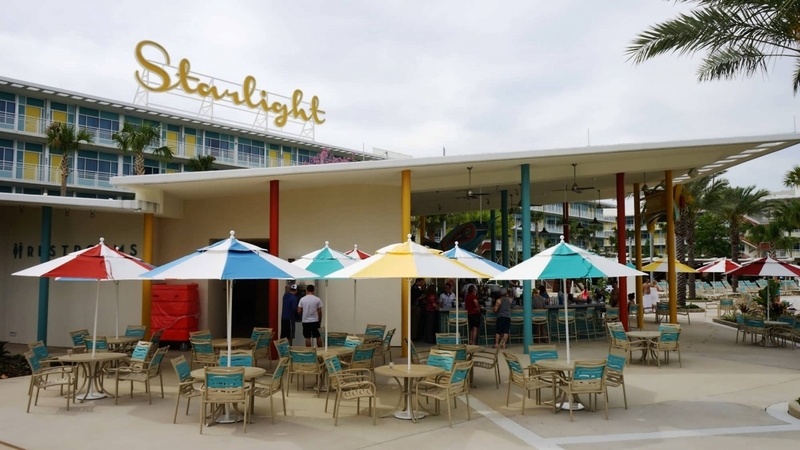 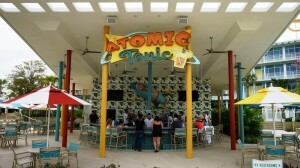 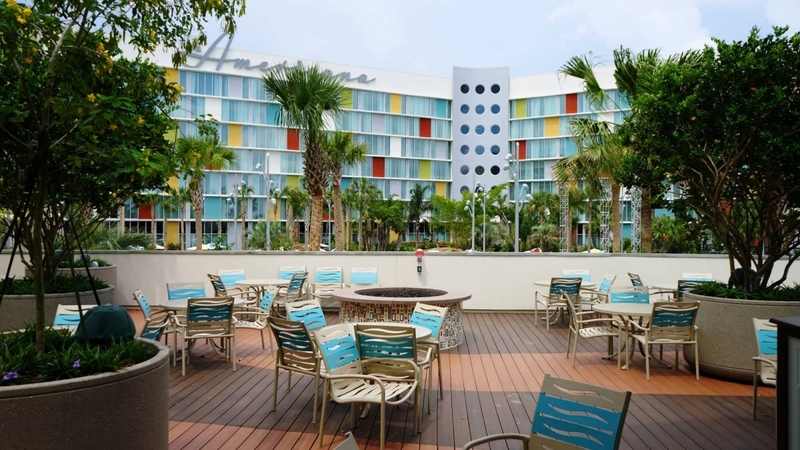 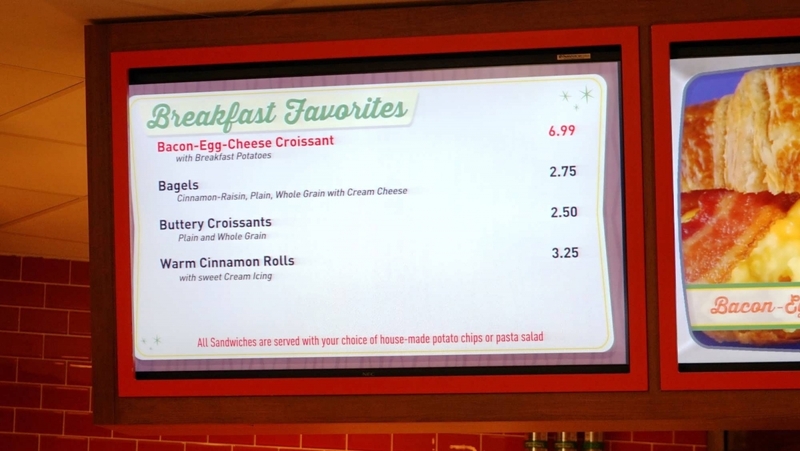 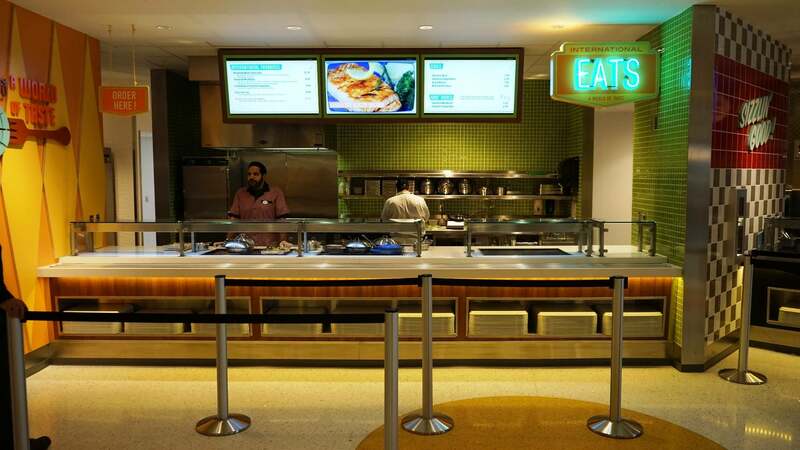 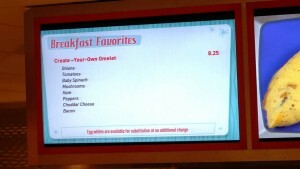 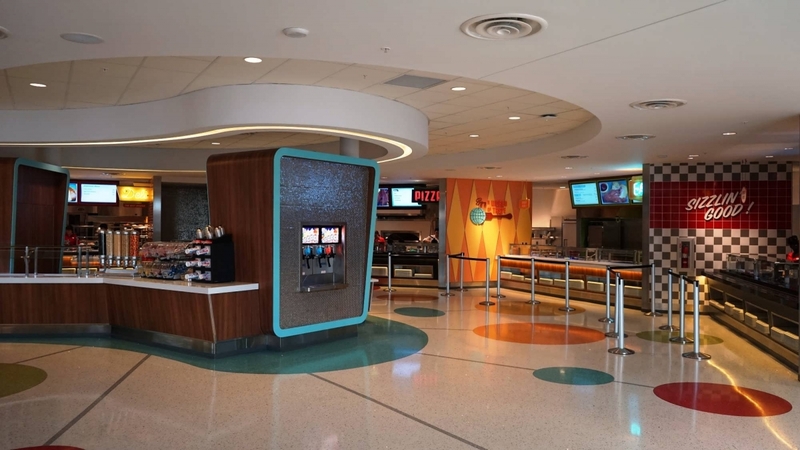 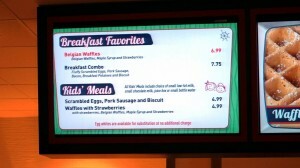 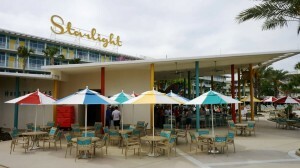 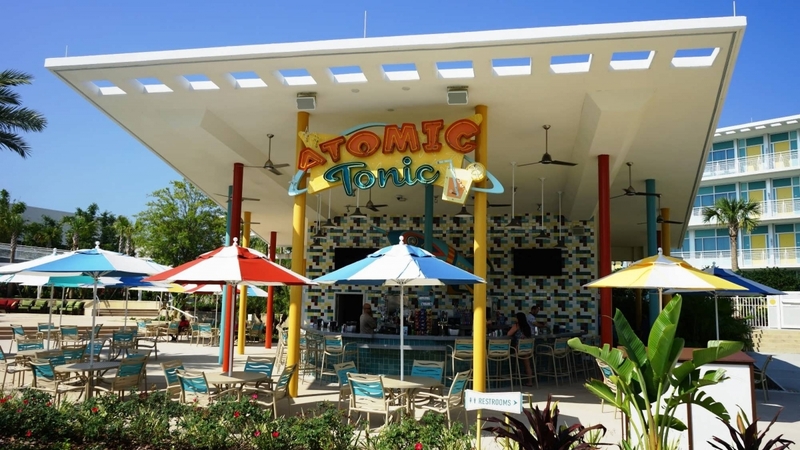 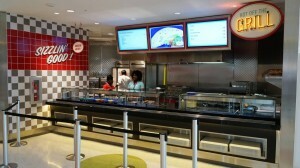 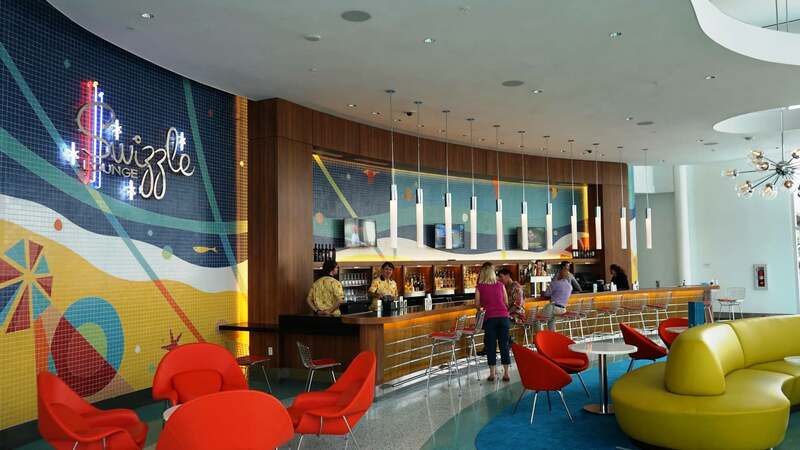 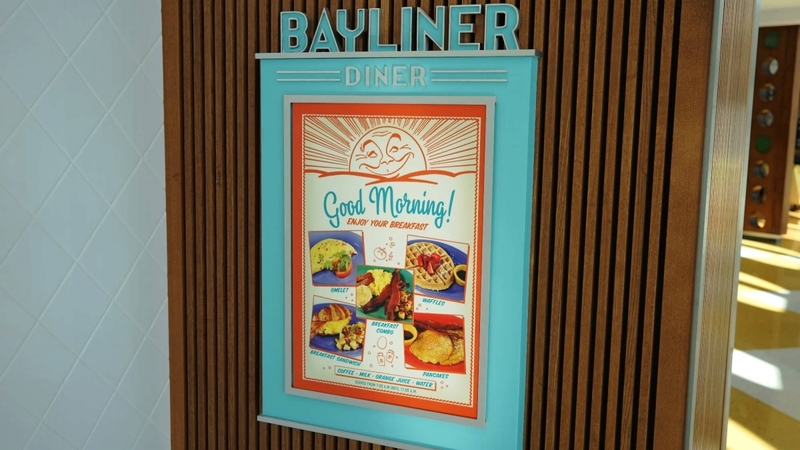 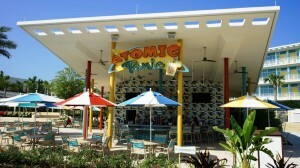 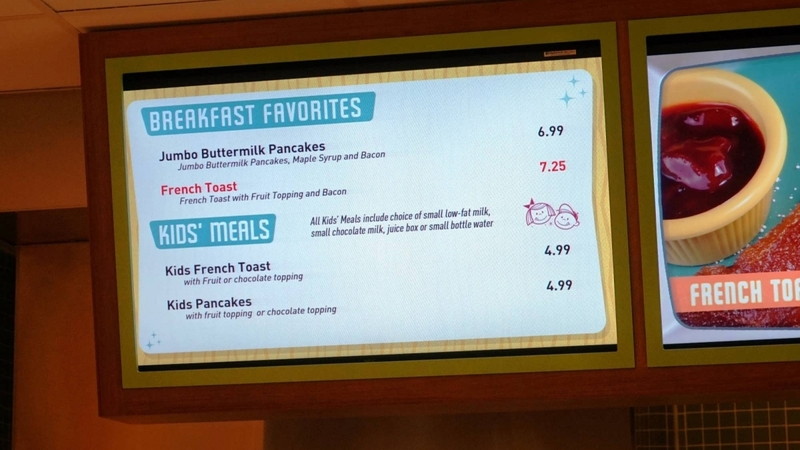 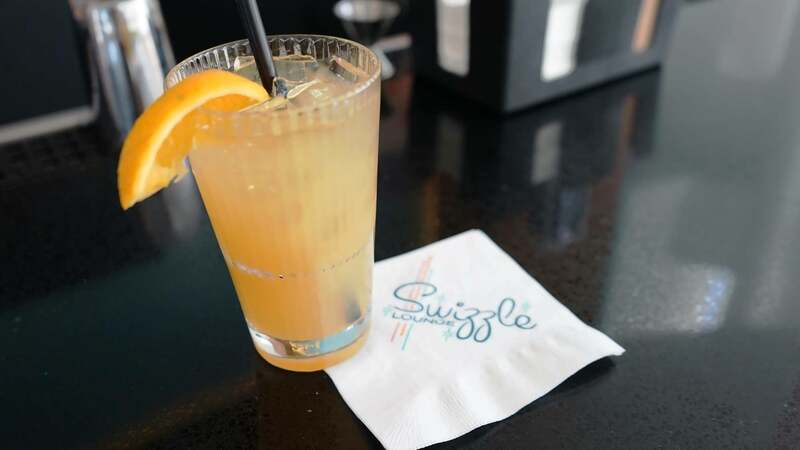 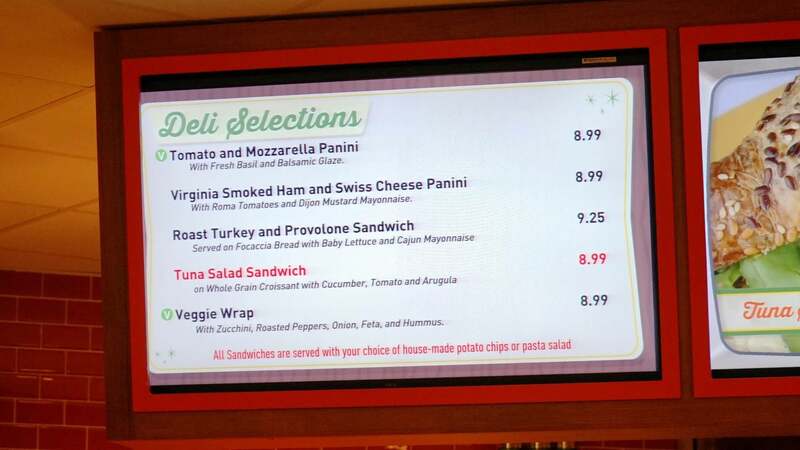 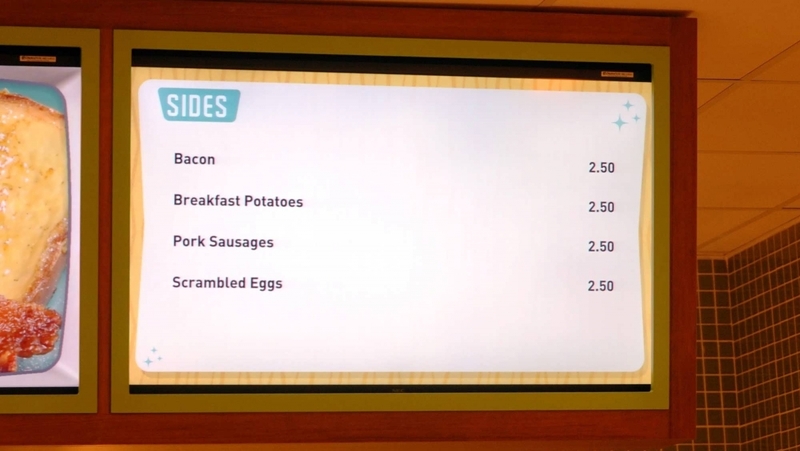 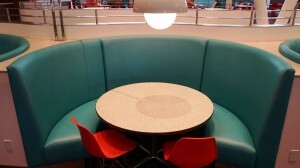 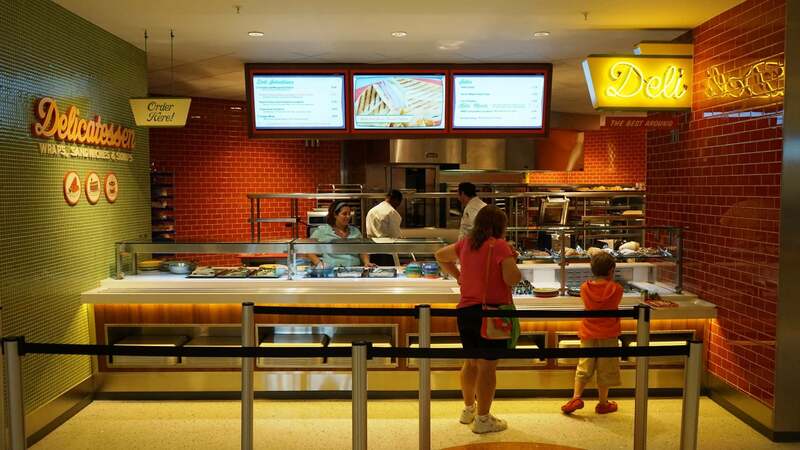 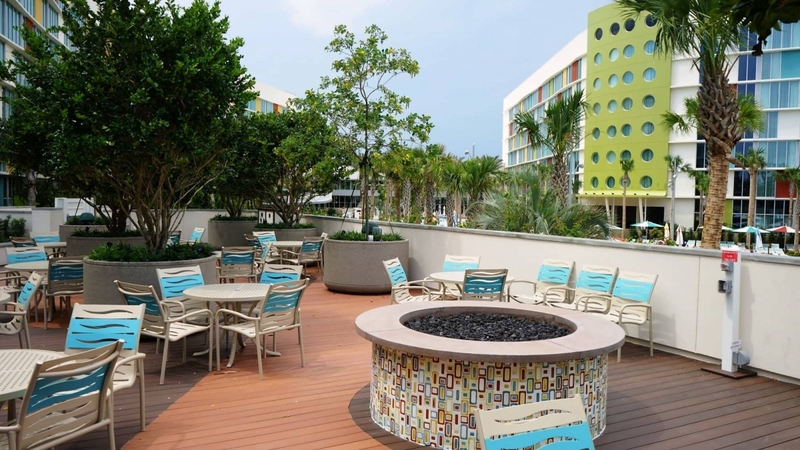 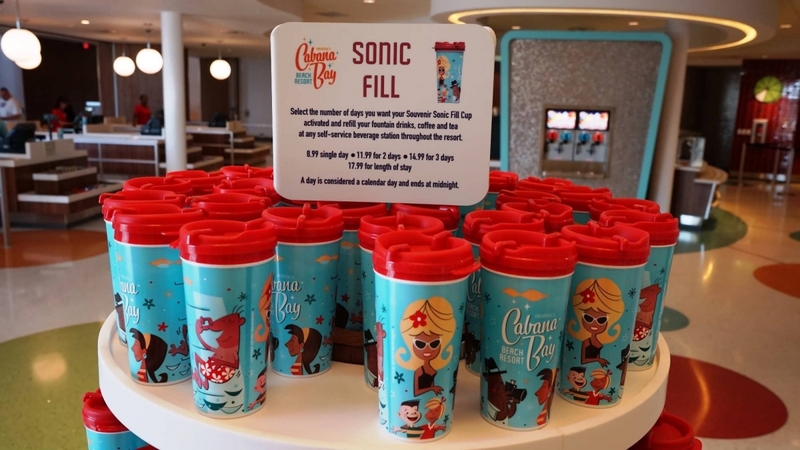 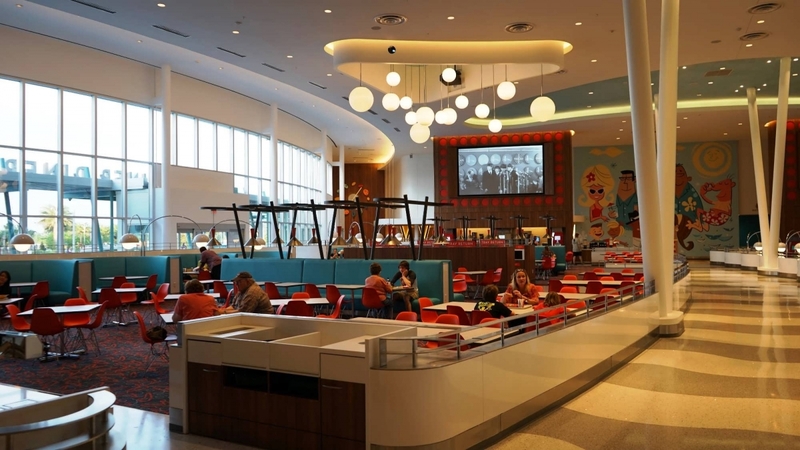 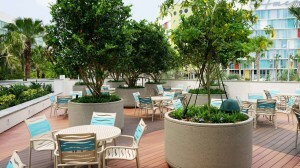 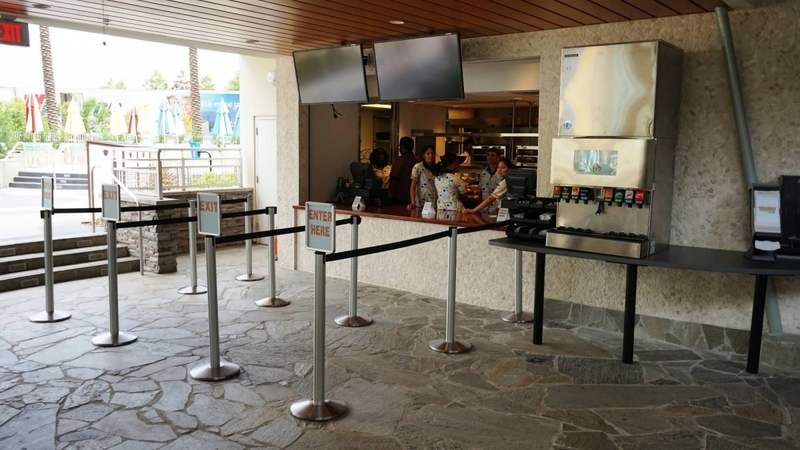 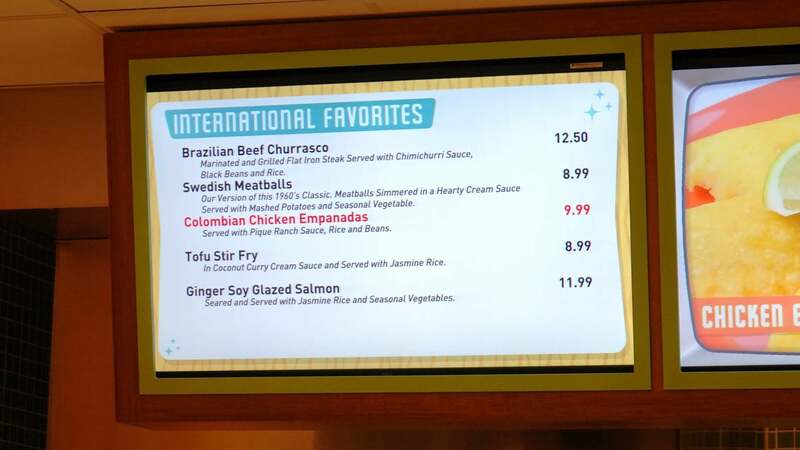 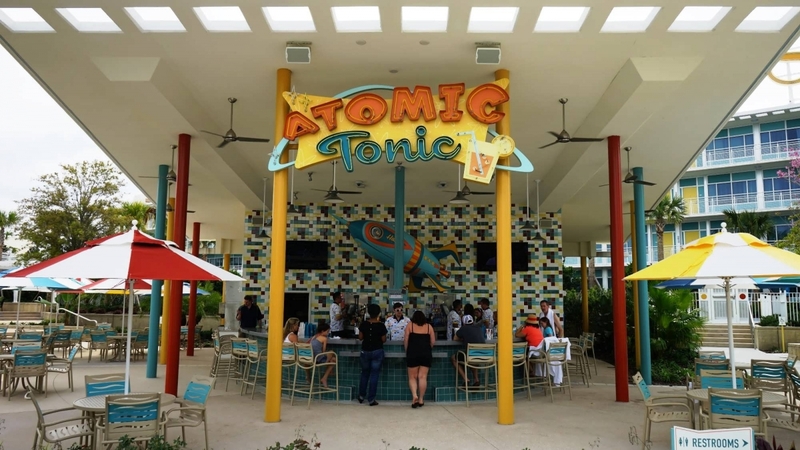 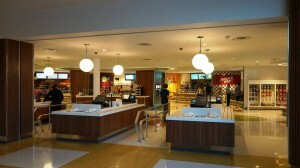 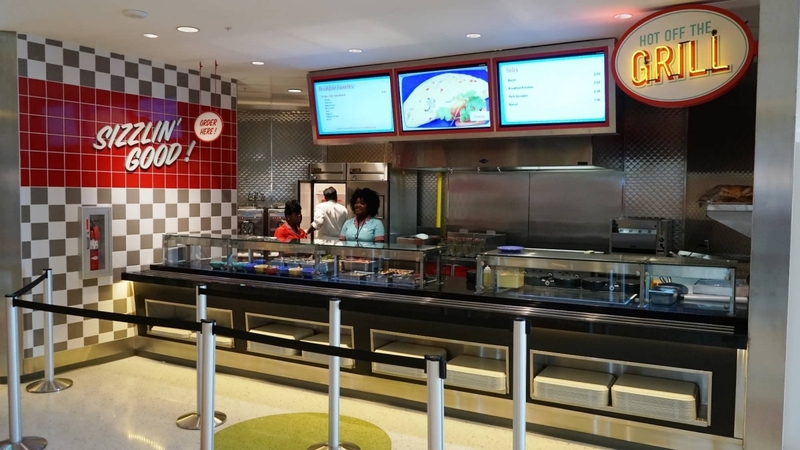 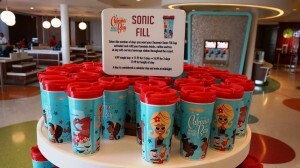 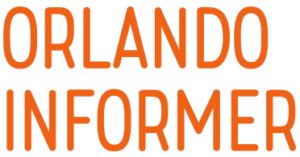 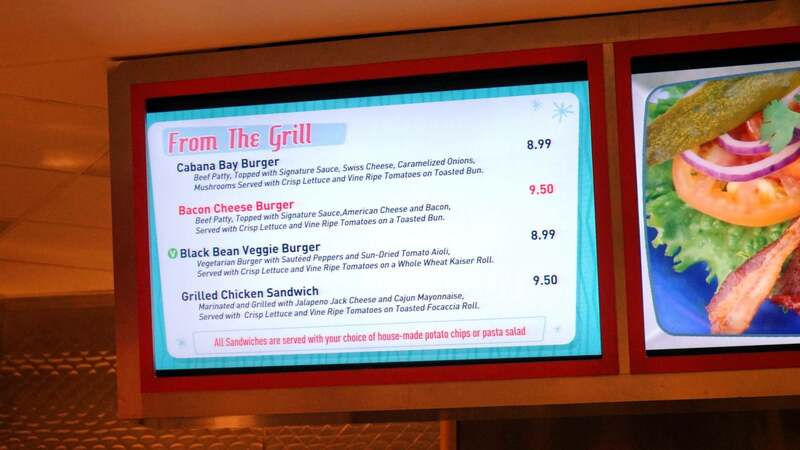 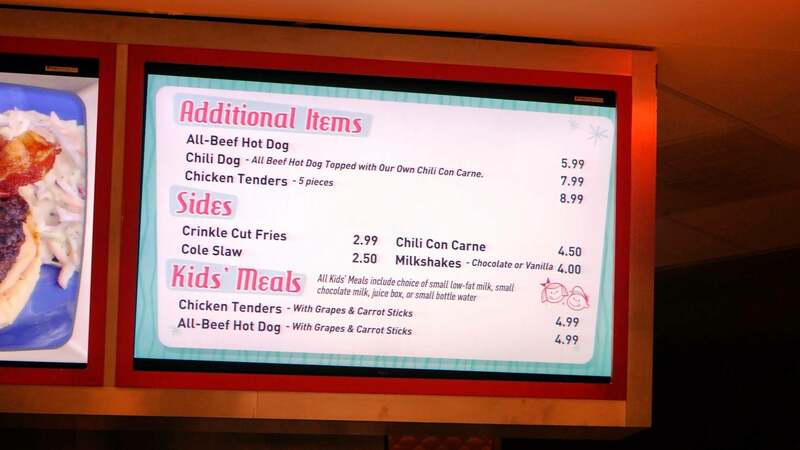 This page features information on and an extensive photo gallery of the dining and lounge options at Cabana Bay Beach Resort, one of the two prime value on-site hotels at Universal Orlando Resort. 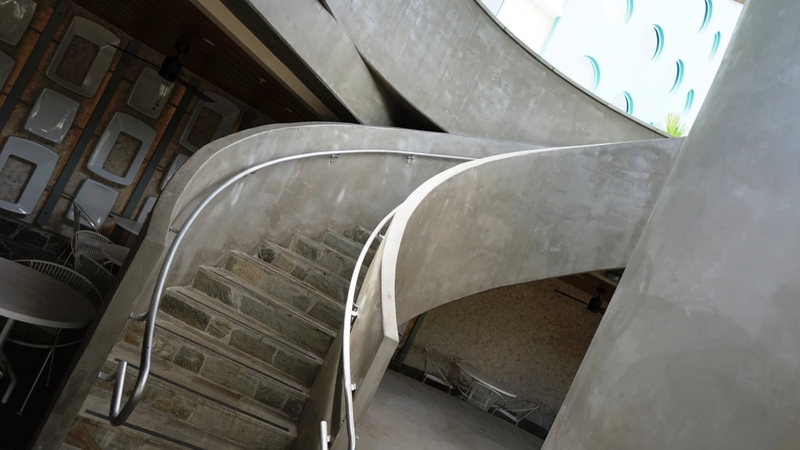 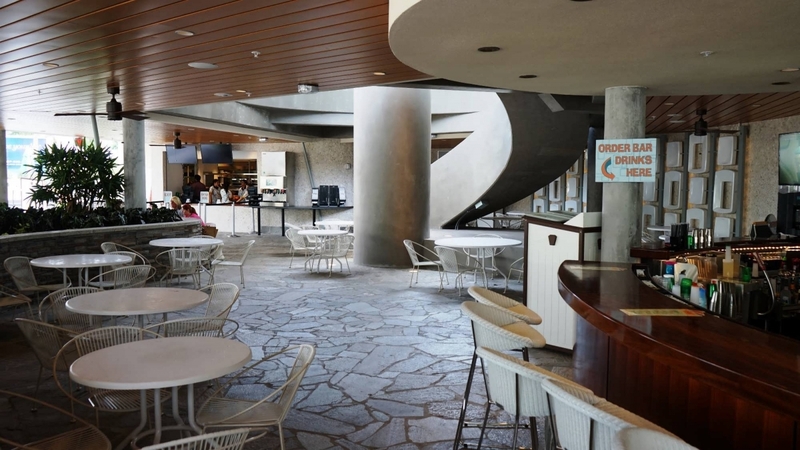 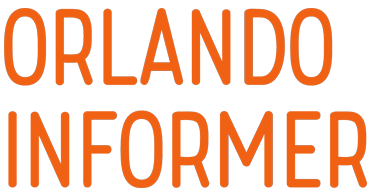 A spacious food court offering quick-service, casual dining consisting of different meal stations, all serving quality and family-friendly food selections. 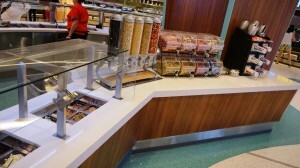 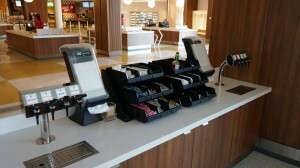 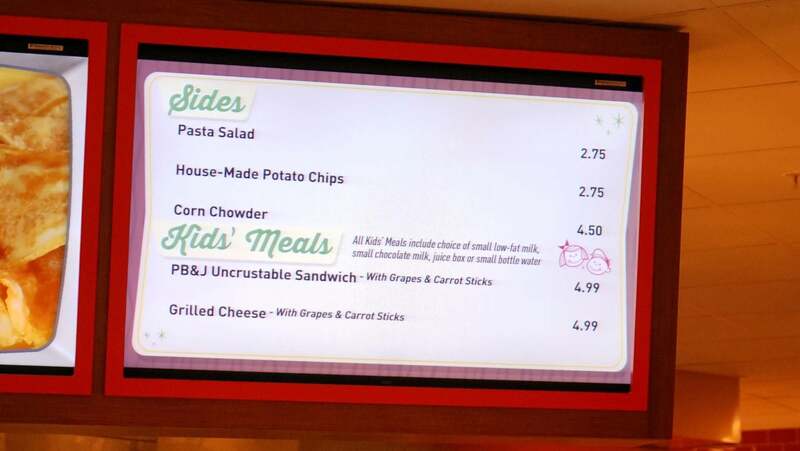 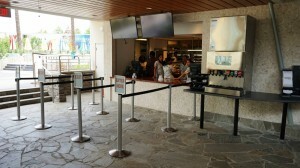 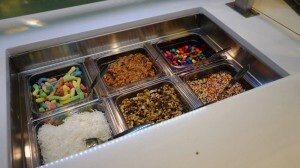 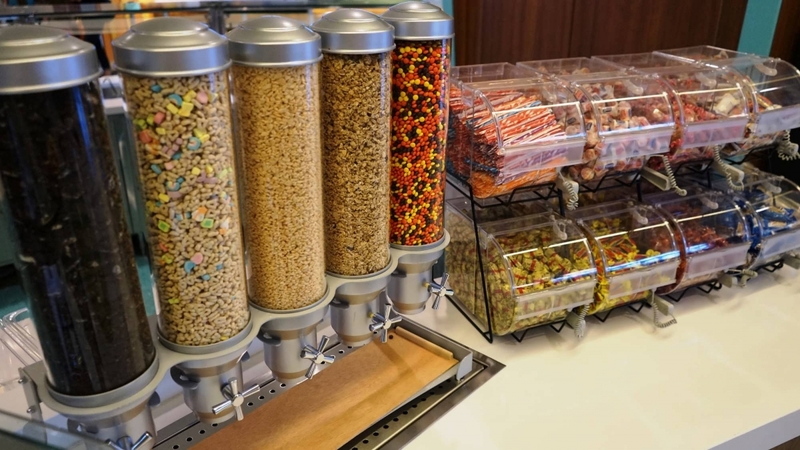 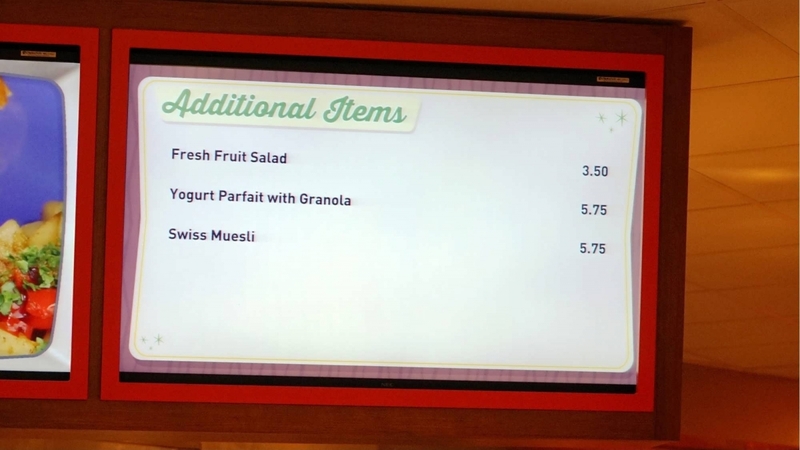 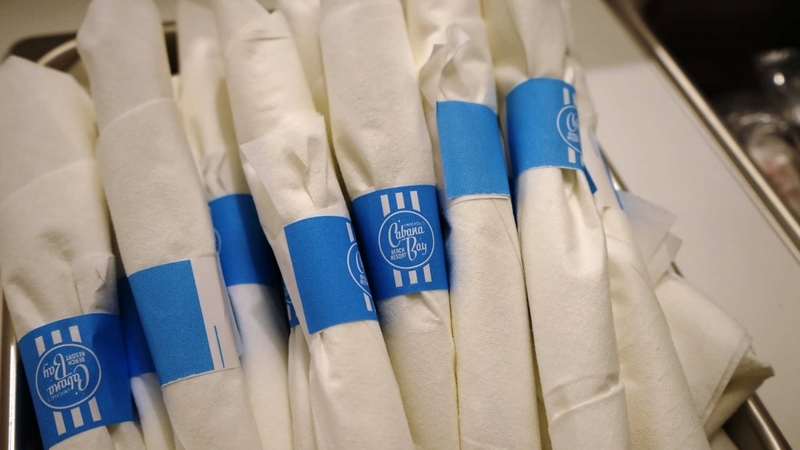 An additional centerpiece station offers salads, frozen yogurt, and candy by weight. 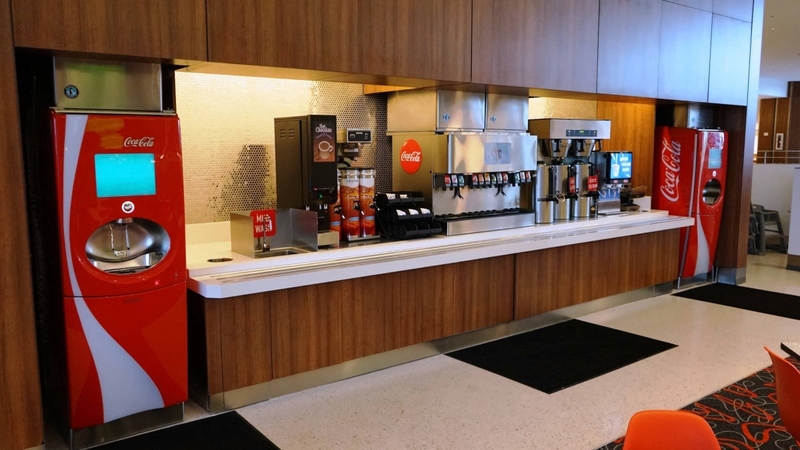 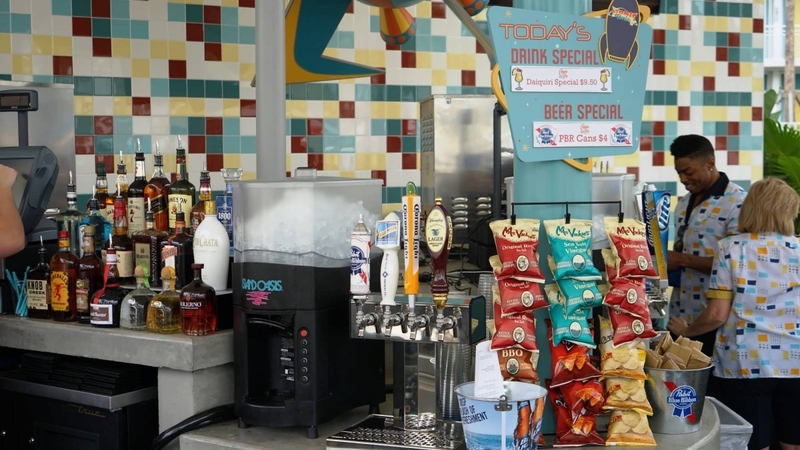 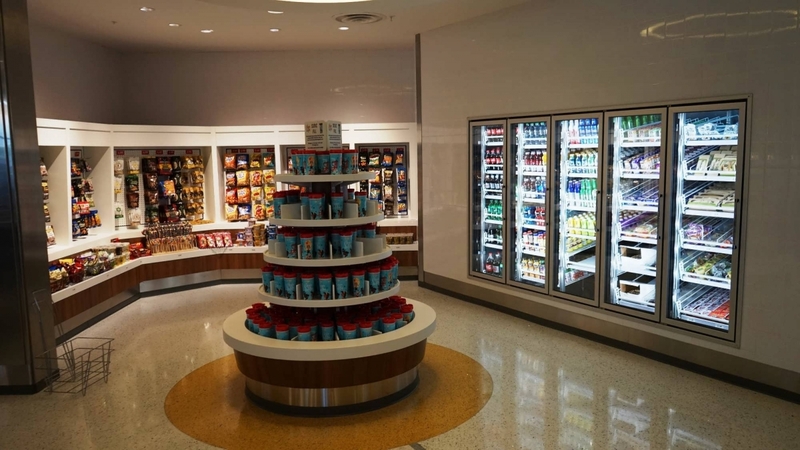 Splits of wine and individual servings of beer are available in the grab-and-go area. 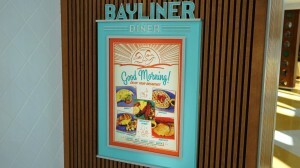 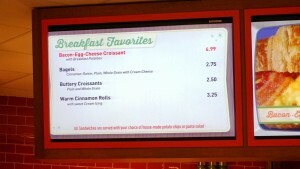 Open 7:00 am to 11:00 am for lunch, 11:00 am to 11:00 pm for lunch and dinner. 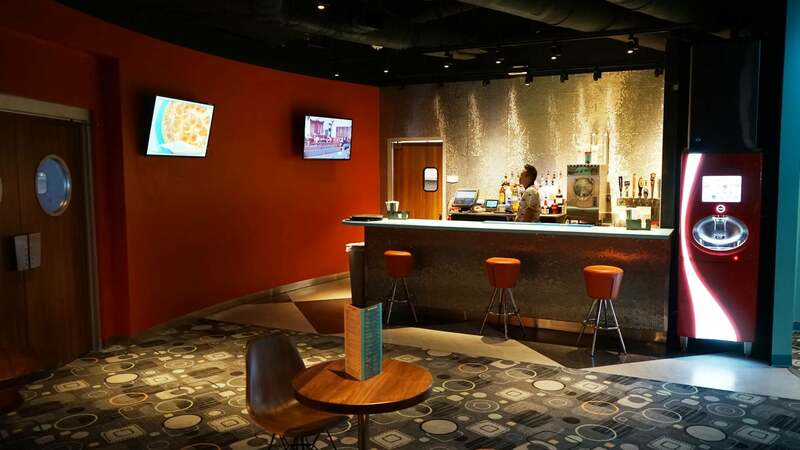 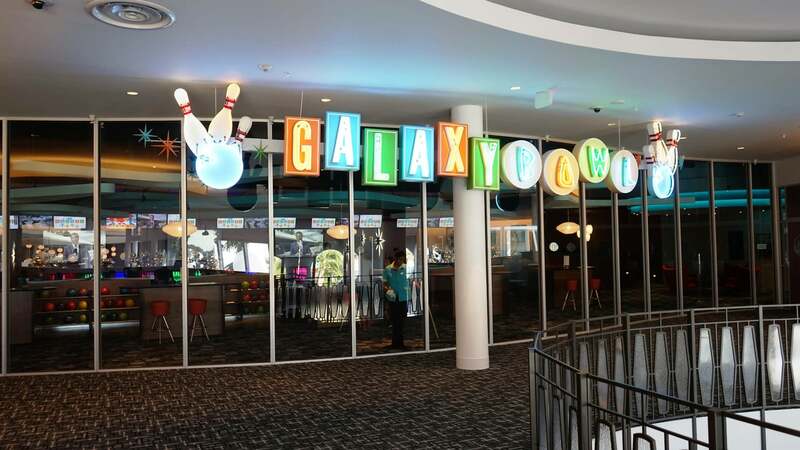 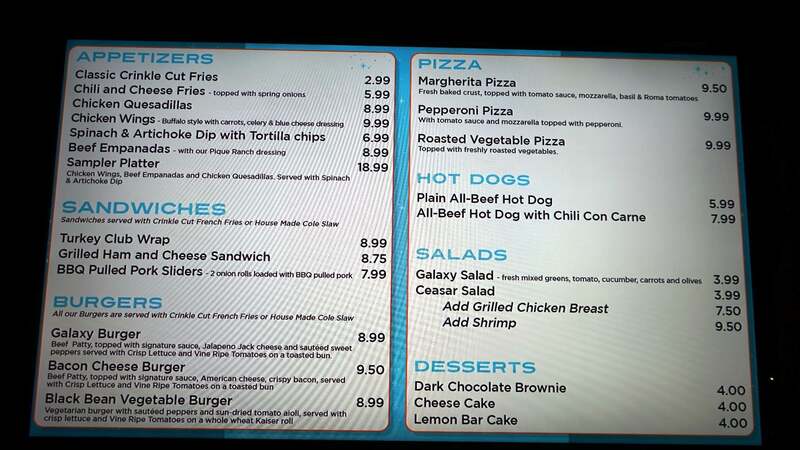 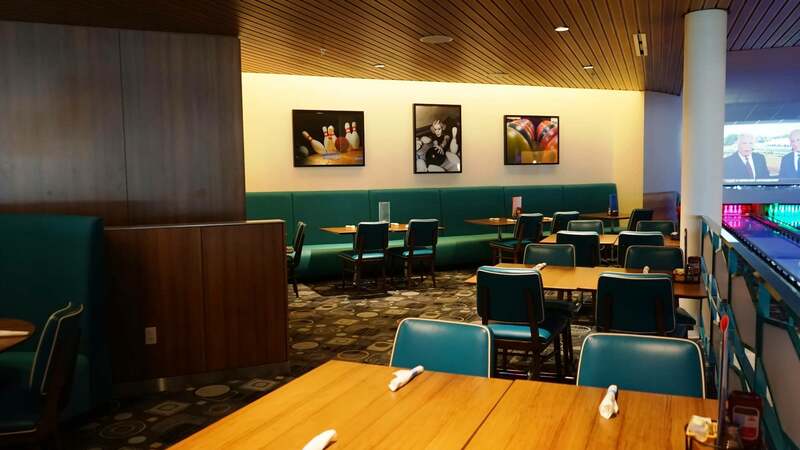 Take a break between frames and enjoy a meal at the Galaxy Bowl Restaurant, located in the bowling alley (which can itself be found on the second floor of the hotel’s lobby building). 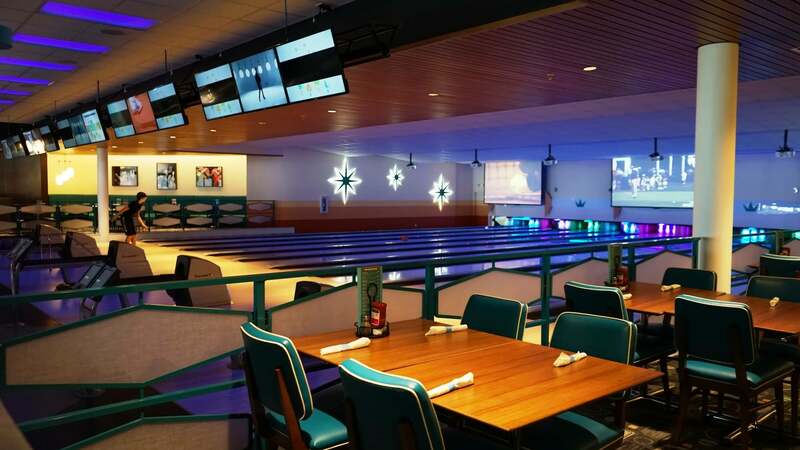 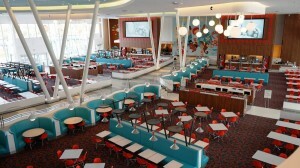 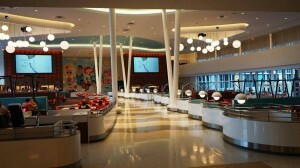 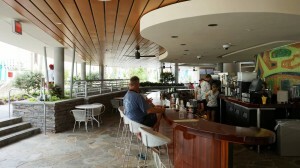 The restaurant features casual, table-service dining amid the fun and energy of music and bowling. Stop for a snack or sit down for an entire meal, including burgers, pizza, chicken wings, specialty cocktails, and beers. Entertainment includes music and recreation staff that host activities such as hula hoop contests and bingo throughout the day. 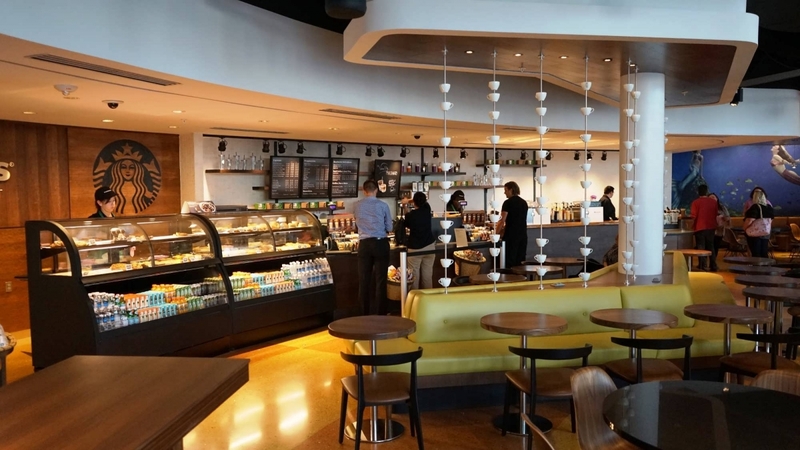 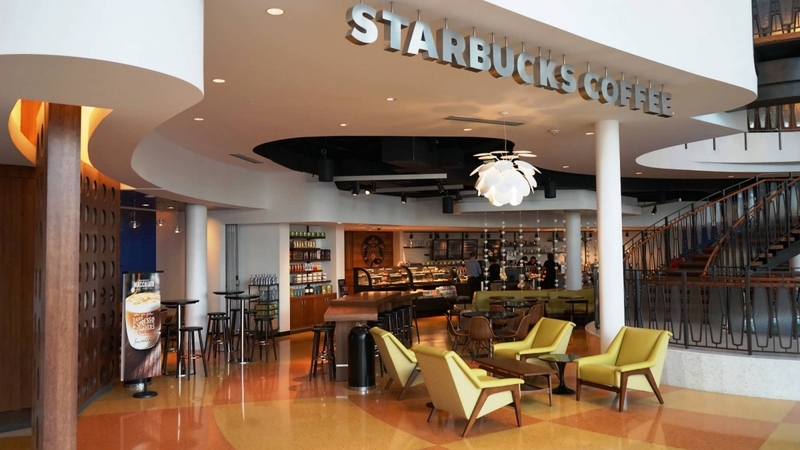 Start your day with a cappuccino before you hit the theme parks or enjoy a caffe latte in the afternoon at Starbucks, which is conveniently located between the hotel lobby and Bayliner Diner. 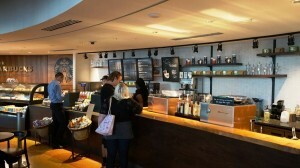 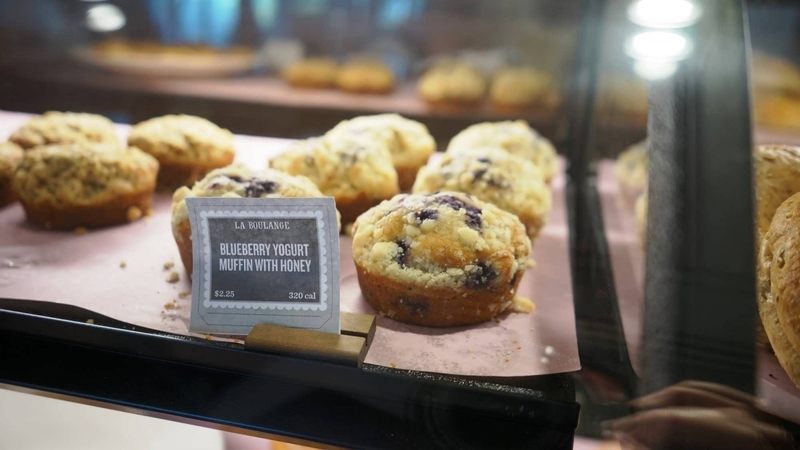 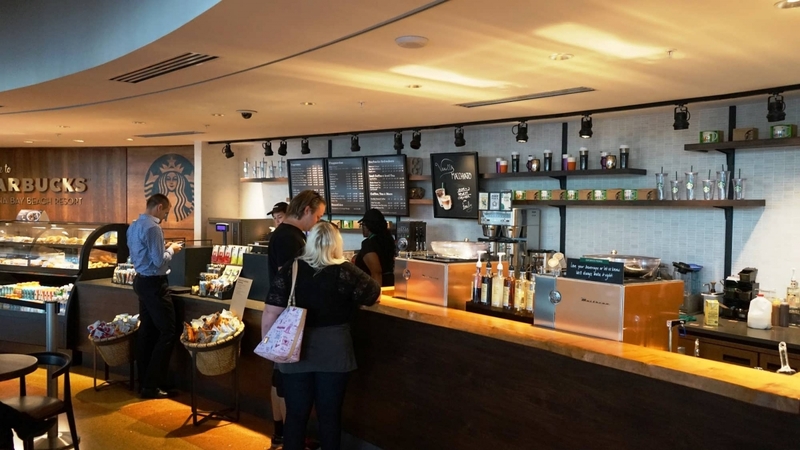 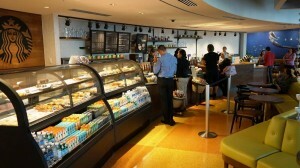 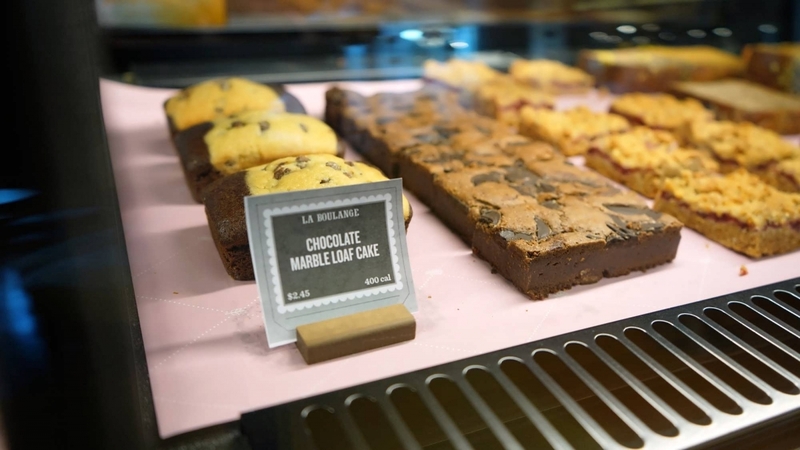 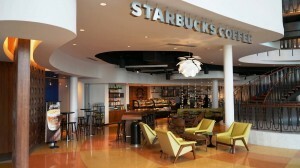 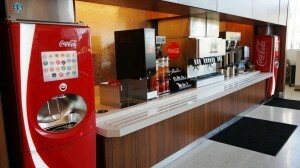 You can sip one of Starbucks’s famous premium coffees and teas or munch on a variety of fresh food items.